Anna: I grew up watching dramas (mostly Hong Kong TVB ones), so they weren’t a completely foreign concept to me. 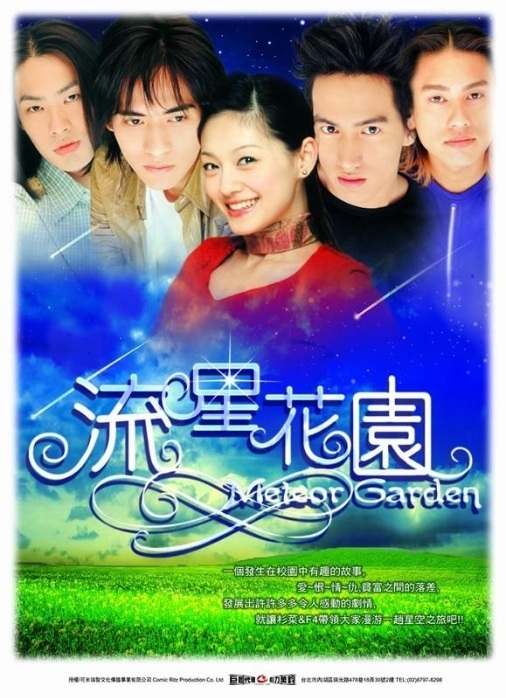 But the one drama that converted me into a full-fledged drama addict is, without a doubt, the 2001 Taiwanese classic, Meteor Garden, aka the original version of Boys Over Flowers. This was the first idol drama that I had ever watched and I became so, so obsessed with the cast, story, music, and basically everything else about it. F4 was my first Asian music obsession, and Jerry Yan & Barbie Hsu’s characters were probably my first real OTP. So many firsts here! I’ve moved on to bigger and better dramas since then, but Meteor Garden will forever have a place in my heart. (Still got that original F4 album!) There have been so many other adaptations of the story, but this will always be the only one for me. Always! Estelle: When I think back to the drama that started it all, it would definitely have to be It Started With a Kiss. Come to think of it now, it doesn’t have the best acting nor the most amazing script, but it had some of that old TW drama charm that made the show so addicting. The lines were so ridiculously cheesy that I cringe when I watch it with another in the room, but it somehow led me down the slippery slope of dramaland and plopped me on top of the soft cushions of addiction. It also started my forever love for Ariel Lin (sorry, Joe, you were just a passing infatuation). In my opinion, ISWAK is a must watch because it still so represents the golden days of TW dramas to me and will always remind me of the humble beginnings of my drama obsession. Well, there you have it! Thanks Meteor Garden & It Started With a Kiss for beginning our eternal love for dramas! What was your gateway drama or the one that started your drama addiction? Tweet us your answer @annaandestelle (#talkforreal) or sound off below! I, too, was exposed to asian dramas since young and I grew up watching Meteor Garden, Princess Pearl, Fated to Love You and all sorts of HK dramas. But I was probably too young to start being addicted to them. What really sucked me into the online world of asian drama was Hot Shot. Even though it was a 2008 drama, I didn’t watched it until 2012. I boo-ed at my brother when I first saw him watching it, telling him “you are lame”. Fast forward 4 years later, there was a re-run on the TV and I fell in love with that show (as well as Show Luo haha) and I started watching it online… exposing me to the plethora of dramas and starting my addiction! I guess that’s why Hot Shot and Show Luo will always have a special place in my heart. Wow, Show Luo! I feel like nobody talks about him anymore these days. I do remember the series Corner with Love that he starred in with Barbie Hsu. Feels like a century ago! I only got exposure to Korean dramas when I went on holiday to Bali, Indonesia. There was always a Korean channel on the TV. I watched a couple of episodes of Romance Town and Sungkyunkwan Scandal. For some reason, something about Sungkyunkwan Scandal just really grabbed me (it was about half-way through the series, where they were really show-casing the Moon Jae Shin-Lee Son Jun-Kim Yoon Hee/Shik love-triangle). I seriously couldn’t stop thinking about for the rest of the night. When i got back to Australia, I watched the whole series within a week, and then re-watched in the following week. It’s still one of my favourites, although I admit I haven’t really watched that many yet. Oooo Sungkyunkwan Scandal! I’ve always wanted to check that out, but haven’t gotten around to. Hmmmmm maybe it’s about time I do 🙂 And Bali! I’m soooo jealous, you have no idea. I’d love to hear your thoughts if you do check it out! It’s such a breezy and fun series to watch. I really enjoyed those Taiwanese dramas when I was younger, I think I really enjoyed HI My Sweetheart, but I never really followed that up with anything. Then my sis was following I Hear Your Voice, and I loved it. Remains arguably my favourite drama! TW dramas used to be so good, but now its really meh for me except a few rare gems. I hope it makes the a comeback! I too grew up watching HK-dramas, but I’ve stopped now since there isn’t any that seems interesting any more. Hmmm, for me, I think the drama that got me addicted to K-dramas was The Beautiful You. My phase with Taiwanese dramas was a bit here and there. I watched a few Taiwanese dramas but didn’t quite really get into full-on drama-addict mode until I re-watched Romantic Princess. I actually couldn’t finish Romantic Princess. For some reason it just didn’t grab me though I liked the actors. I’ve never seen To The Beautiful You, but I did watch Hana Kimi the TW version with Ella and Wu Chun. I loved it, re-watched it a number of times. Did I say To The Beautiful You? I meant You’re Beautiful! Whoops! I saw the TW version of Hana Kimi too! Ah You’re Beautiful! ❤ JGS forever.